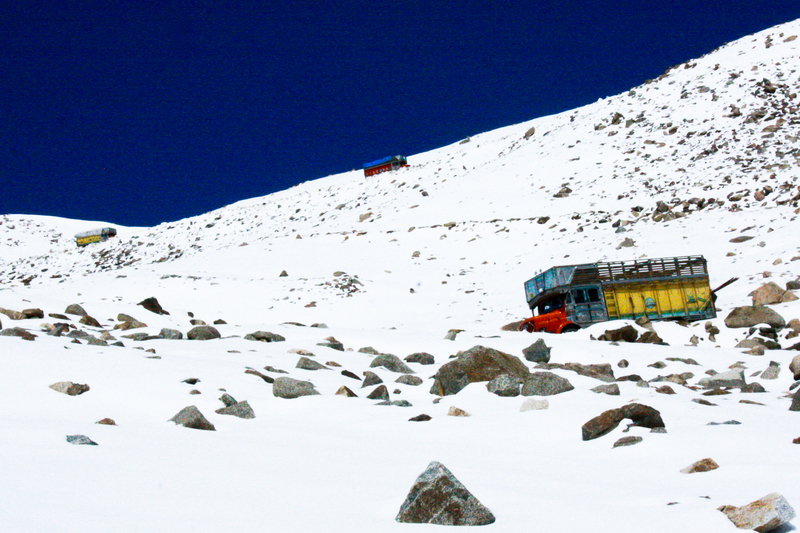 The pass of Khardung La lays claim to the title World’s Highest Motorable Road. The sidewinding thoroughfare in the Himalayan mountains of far northern India climbs to 18,380 feet. But a fierce debate rages over this superlative. A road across the Tibetan border, called Semo La, and another called Marsimik La, several miles to the northeast, may, in fact, stretch higher. But about this there can be no debate: Khardung La is the most accessible, widely used, and storied of these precipitous Himalayan passes. The road comes to twenty-two punishing miles of washed-out, chewed-up, ice-coated treachery cutting through the heart of a much disputed region called the Kashmir. Making it to the top of Khardung La is hardly a given. Avalanches and landslides are a perpetual risk. The pass is an engineering marvel; an incredibly steep road cut out of bare mountainside. The road is also of critical military importance. The Pakistani army keeps huge numbers of troops in the nearby Nubra Valley and their incursion onto Indian soil remains a threat to Indian forces stationed along the road. The Khardung La also happens to lead to some of the most stunning mountain vistas known to man. Danger and beauty go together in the Kashmir, just as they have for centuries. In mid-June, I landed with my ten-year-old in Leh, a backpacker’s paradise that doubles as the on ramp to the Khardung La. Our first attempt at the pass had ended in disappointment. Halfway up the southern slope of Khardung mountain, our SUV had been turned around at an army check-post due to heavy snow and impenetrable clouds. Three days later, in the early hours of a beautiful June morning, we met our driver outside of our guesthouse in Leh, ready to have another go. Our driver’s name was Tam Pel. He was an exceptionally short, exceptionally jovial young Ladakhi man of Tibetan origin. We had been traveling with him for several days at this point, and as he climbed out of his tiny Mahindra van he greeted us as dear old friends. I was happy to see him, but surprised by his ride. 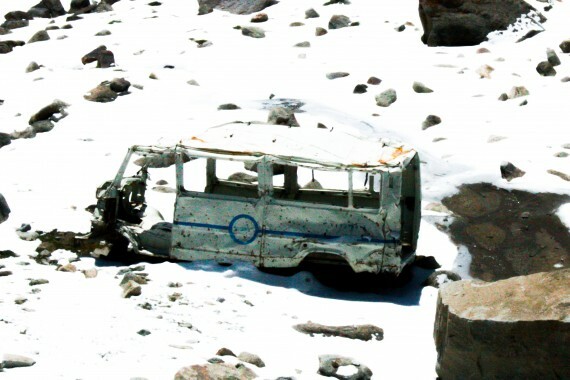 He was, apparently, under the impression that the three of us could scale the heights of Khardung La in his beat up, red jalopy which had rattled and wheezed trying to make it around Leh. “No, no,” Tam Pel assured me. “It is old car, and strong car.” My son and I swapped incredulous glances, but I knew Tam Pel had climbed the pass countless times, carrying passengers to the villages on the other side. With clear, sunny skies overhead, and riding the wave of Tam Pel’s confidence, we piled into the van and set off. But the lorries were still miles ahead. In the meantime, the van climbed steadily, zigzagging around hairpin bends on well-maintained blacktop. The mountains were a chocolate moonscape, barren scree slopes littered with boulders, interrupted only by occasional snowmelt streams that leapt and tumbled from immeasurable heights. With the van windows down, it seemed a wind-silenced world. The van moved quickly and smoothly, though as we darted around narrow, blind curves, I began to fear a collision with oncoming traffic. Tam Pel informed me that there was no cause for concern. The transport authority had very wisely decreed a schedule for this road. In the mornings, traffic moves in one direction, from Leh towards the pass and Nubra Valley beyond. At one in the afternoon, the traffic pattern reverses. Reassured, I sat back and watched through the window as the valley floor receded beneath us. After an hour, we reached South Pullu, where we had been turned back before. This time there was no delay. We produced our permits and the soldiers waved us through. The entirety of Kashmir is claimed by both India and Pakistan. As such, the road to Khardung La has immense strategic importance for moving troops and supplies from the massive military bases in Leh, to the front lines of the Nubra Valley. For this reason, the road is well guarded by contingents of cold and downtrodden soldiers at checkpoints like South Pullu, which in clear weather, I could now see, was nothing more than a clutch of thick tents and small concrete bunkers, clinging to the side of the mountain. Upon passing the gate at South Pullu, the driving conditions changed drastically. We hit the snow line from the previous storms and the brown, rocky earth was now covered in a thin layer of white. The road also altered. Gone was the blacktop. In it’s place, rut, rocks, and mud. My son began to laugh as he was thrown to and fro across the beltless back seat of the van. I felt as if I was trapped on a poorly maintained, low-budget carnival ride. As we ascended the steep ridge, the situation deteriorated further still. We were now bouncing up a path that had moved perilously close to the un-railed edge of a cavernous ravine. At the bottom, I glimpsed the twisted and crumpled metal frames of lorries that had gone over the edge. “Oh yes,” Tam Pel stated gravely, “many trucks and cars go over the side. There is nothing any person can do, so they just leave them there.” He then informed me that on the day we had first tried to go up, an SUV just like ours had slid on the ice and plummeted over the edge. A family of five had been inside, and none had survived. My heart beat faster in my chest. The snow deepened and patches of muddy ice began to pock the road. Tam Pel’s face was a picture of first-gear determination, as he willed his tiny van through deep, boggy stretches of mud and over pools of ice. The ruts and holes were of ridiculous proportion, and I doubted the van could make it to the top. Tam Pel was undeterred. He asked me to climb over to the back seat with my son so that there would be greater weight on the rear wheel drive. He admitted that conditions were very bad, especially for mid-June, but assured me that we would prevail. We attacked the road. Tam Pel thundered around the curves, not venturing to slow down for fear that he would become immovably trapped in the mud. In the back, the two of us were tossed mercilessly against the sides of the vehicle. No longer laughing, my son looked at me in dismay. He asked how much longer to the top. I did not know the answer. The icy madness continued for another hour. We rounded a curve and saw a line of traffic stopped ahead. Tam Pel jumped out to make inquiries into the problem. The snow had loosened boulders from the slopes above, and many of them had tumbled onto the road. Apparently, a lorry had collided with one of these wayward rocks. We could go nowhere until a path could be dug around it. For forty-five minutes, we huddled there in the van, the effects of oxygen deprivation beginning to set in. We were at 17,000 feet. I felt dizzy and had a headache, and was desperate to get moving again. Finally, the line of cars and trucks began to lumber forward and, one at a time, we squeezed around the disabled truck, our mirror scraping the side of the cliff as we went. At the next bend in the road, we could see the top of the pass in the distance, just beyond a forty foot wedge of upturned rock. There were still several jarring curves to navigate, but we were nearly there. The backup caused by the lorry had slowed traffic to a crawl. The track was almost completely iced over at this point. In the last mile and a half, we had to stop two more times, as cars and lorries slid into the rocky mountainside and nearly blocked our path. I found myself admiring Tam Pel, and his audacious little van. I admired his determination and his savvy, for he had now taken us around the last bend, and we were at the top. 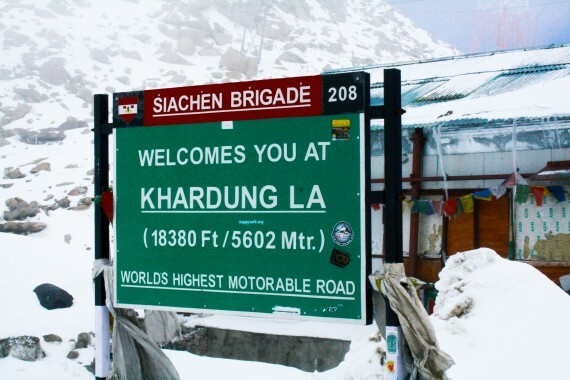 The summit of Khardung La is populated by a contingent of even more hapless soldiers of the Siachen Brigade, who guard this strategic point on the roof of the world, and huddle together in a couple of wooden and concrete bunkers. There is also a small tea shop and a Buddhist shrine, draped with colorful prayer flags, which are perpetually beaten and unraveled by the unrelenting wind. Tam Pel pulled over alongside one of the bunkers. I climbed out of the van, feeling like I had been attacked by an angry kick boxer. I was bruised and battered, but happy to be there, at the top of the highest road on earth. My son was giddy at the deep snow, and wanted to have a snowball fight. I gave it a shot, but after about ninety seconds of frolic and jest, found myself exhausted by the lack of air at that elevation. Instead, we got a cup of tea, and stood looking out at the Nubra Valley, ringed by majestic peaks. The treacherous pass had taken its best shot but, with the help of one intrepid driver and his shoddy little van, we had conquered Khardung La. Chris Watts is a contributing writer to EthnoTraveler.